So it was the Sunday after Thanksgiving and I decided to go ice climbing with my friends Mike and Crystal Gasell. My girlfriend Ryann had to go back to school so I told her parents I would take her to the airport in Denver and hook up with Mike and Crystal there. The plan worked out perfectly and we got a long day of ice climbing in at Lincoln Falls just south of Breckenridge, CO on Hoosier Pass. I got to Mike's place right after 9:00am and we left for Breckenridge right away. We stopped for breakfast sandwiches in Breck and continued on to the top of Hoosier Pass, probably 1.5 hours from Denver. 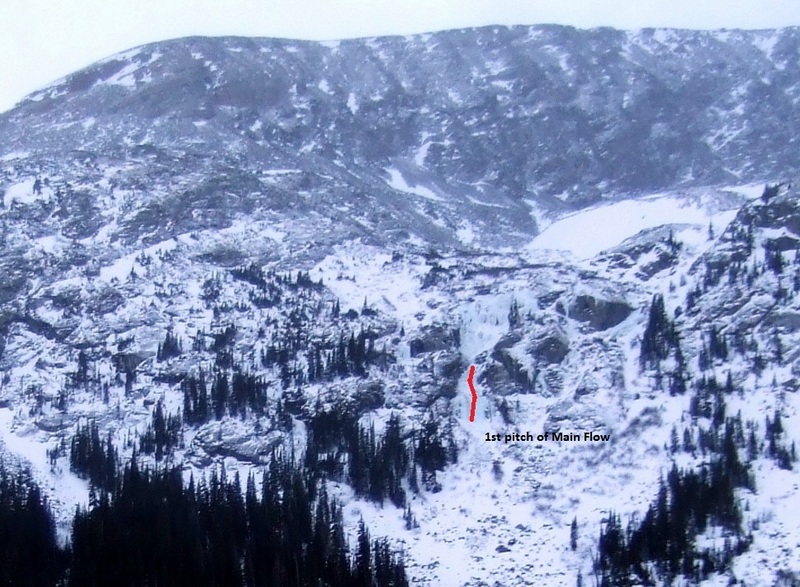 Lincoln Falls is a great place to ice climb because it is a fairly easy approach and offers a variety of terrain from fat flows to pillars and even a little mixed climbing. Since we got a later start than usual we arrived at the base with 2-3 groups taking up a good chunk of the main area. We warmed up and got ready for the thin right side as one of the parties was cleaning the route and heading out. The route was a little brittle and thin, but it was a fun WI 2+/3 and offered some good technical climbing. Apparently showing up late wasn't all bad; by the time we got done with the first route the other groups were heading out! After the right line we decided to jump on the first pitch of the Main Flow that follows the center line of Lincoln Falls. It was a bit thicker and pretty wet, so the ice was more plastic like and our sticks were solid. It took screws well and allowed for comfortable stances to rest and shake out. It was pretty cold, so the screaming barfies were around the whole day. All three of us battled them! I lead both routes and they were exciting and fun routes for the first ice of the season. It was probably only WI 2, but it was a good route to climb and get in shape for the season. We only climbed the first pitch, but the entire route looks like a beast! 2+ pitches at WI 2+ and WI 3+ at the top. There are curtains, pillars and even chandelier ice at the top that would make for a spicy route. This is definitely one of my favorite places to ice climb in Colorado because of the easy approach and the huge variety of routes. It was a great day and Mike, Crystal and I all climbed well. We left around 4:00pm after climbing for a good 4+ hours and picked up coffee and hot cocoa in downtown Breck. I am looking forward to getting back to Lincoln Falls this weekend with my friend Austin. I think we will try and do both pitches of the Main Flow.